Scenic drives offer great opportunities to see the national parks from the comfort of your car. They’re a fantastic alternative for those with limited mobility or kids. Others may just need a break from all that walking! Be aware that many roads close during the winter months, and to always check for potential closures before your trip. Here are six our favorite national park scenic drives from across the nation. This scenic drive boasts the highest continuously paved route in the United States. On your journey, you’ll reach a maximum height of over 12,000 feet! Along the way, you’ll encounter majestic views of the Continental Divide, flowering columbine, and autumnal golden aspens. Keep an eye out for elk year-round and other wildlife, especially at dusk and dawn. This 50-mile highway crosses the Continental Divide at Logan Pass, where you’ll come face-to-face with magnificent scenery, as well as mountain goats and sheep. A park-operated bus tour can help you avoid road congestion in the summertime, or drive it during the spring or fall to avoid traffic. The Montana national parks truly can’t be beat! Mountains, meadows, and lakes, oh my! Grand Teton’s star attraction offers a spectacular scenic drive through diverse plains and mountains. You’ll also see plenty of wildlife. Be careful as the bison and elk don’t always look both ways when they cross the road! Travel up this mountain for the first glimpse of the sun’s rays as they brush the eastern coast first thing in the morning, and the first tentative appearances of the stars as they emerge in the night sky. You won’t be able to help feeling awed and peaceful here. Moose sightings are not uncommon in this area, especially at peak sunrise and sunset time. 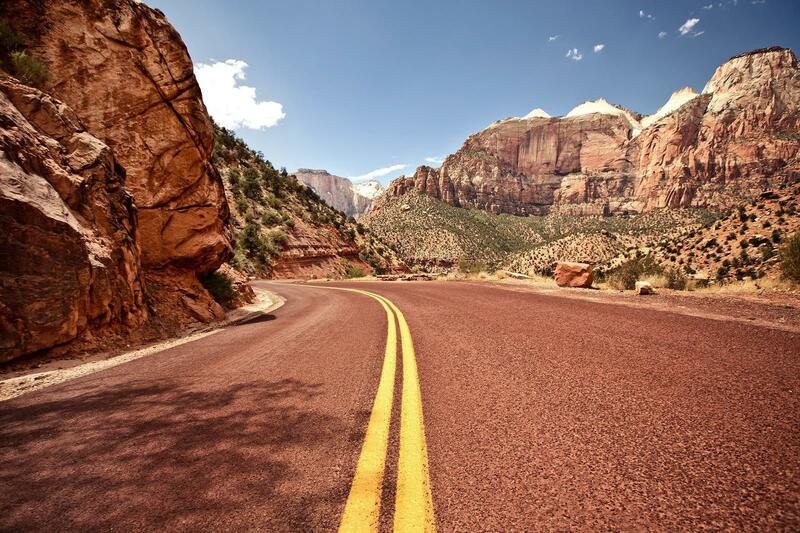 Sweeping red mountains tower over the earth along this scenic drive through Zion National Park. And at only five miles, it requires less of a commitment than the others on this list —great if you want to pause and take a short hike or some photos along the way! Begin at Tioga Pass and travel through marble mountain ranges dotted with shrubs and trees. You’ll drive through picturesque Tuolumne Meadows on your way to shimmering Tenaya Lake, then take out your cameras at Olmstead Point to capture some great photos of Half Dome. Plan about three hours for a round trip, but definitely don’t miss this one! You can learn more about scenic drives available in Yosemite and Zion, plus others found in the American Southwest, by reading our itinerary here. Want to learn more about scenic drives through the national parks? Contact our experts at Visit USA Parks for more information, and for help crafting the perfect vacation.